PARIS – June 19, 2012 – Brain Candy, the high fructose independent game developer with 10 members from France, proudly announces the launch of their simultaneous turn based strategy game, Fray, on Steam. A first of its kind, Fray combines the strategic thinking of real-time strategy games with the fast-paced action of shooters to create a new and unique hybrid game unlike anything you’ve played before. To see the action one more time before diving into the future’s most dangerous virtual world, view the explosive trailer on YouTube. Players can finally enter the dystopian future of 2098 where Earth’s remaining resources are controlled by mega-corporations and a desperate humanity seeks refuge in virtual realms. In combat module Fray, players pledge allegiance to one of three mega-corporations and control a squad of four characters to face off against other corporations’ squads. Fights happen in turns and are comprised of a definition phase and a resolution phase. 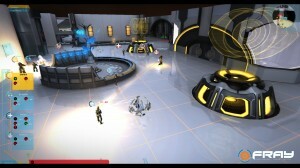 Players give each member of their squad orders during the definition phase: shoot, move, deploy equipment, use personal bonuses or powerful team bonuses and then watch the results of their actions during the resolution phase: seeing how opponents strike back and who best anticipated and trapped the other teams. In Fray, game over spells death in real life!